Personalized Van Magnets Custom Printed in Bulk. With Pad and Pen. Promotional, Inexpensive. Budget Prices in the USA and Canada. 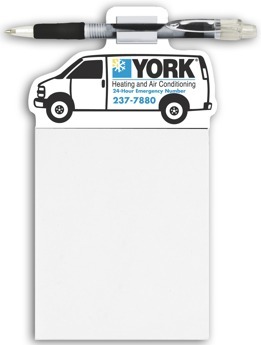 Bulk personalized van magnets with a 50 sheet pad and quality retractable pen. Budget Prices in the USA and Canada for wholesale custom imprinted van magnets with pads and pens . Contact us if you need a rush delivery of our custom van magnets. Unit prices below include your one color custom imprint on white magnetic surface. Add the amount shown for each extra imprint color. Free artwork design. We will send you a proof for your approval before production. US clients pay no taxes. Setup Charge: $29.00 per color. • Magnet Thickness: Approximately .030 (30 mil.) The large, thick magnet will hold easily the weight of the pad and pen. • Production Time: 5-7 days after art aproval. Contact us for faster production.